Meal Planning Board- Pinterest Success! Pinterest is simultaneously so amazing and so awful. It’s amazing because you get motivated to clean and organize your home, life, EVERYTHING! However, it’s awful because you spend the entire hour both kids are napping sitting on the couch looking at Pinterest- meanwhile the dishes aren’t washing themselves nor is the laundry folding itself. The hours I’ve spent on Pinterest have forced many a load of laundry to be re-washed or tumbled dry for just a *little* longer to get those wrinkles out. 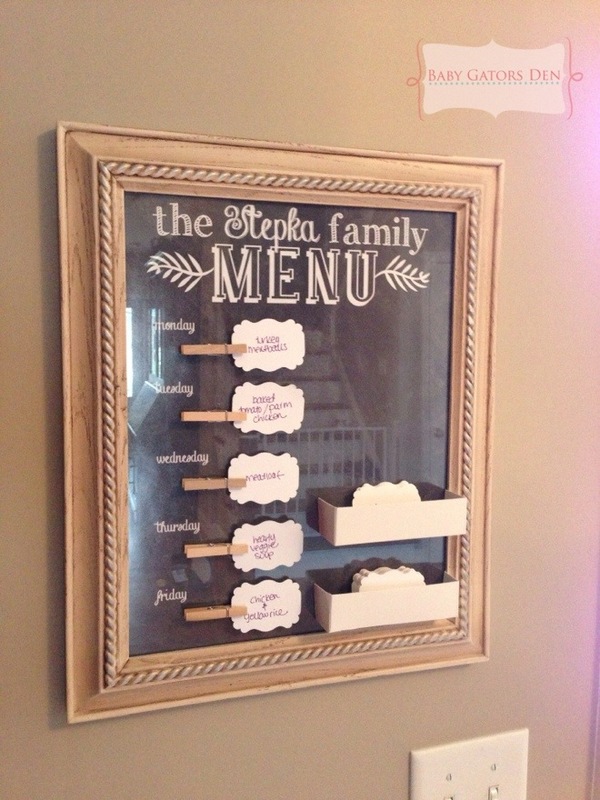 I found the original meal planning board from this pin, which came from Sarah’s blog: Life Sweet Life. You can find detailed directions to make your own meal planning board here. Sarah used bright, fun colors which I LOVE. I don’t know why, but I totally chickened out at Hobby Lobby and went with the same boring neutral colors I always pick. I can always spray paint later, right? What do you use for meal planning in your home? I love hearing new tips & tricks, thanks for sharing! Gorgeous! So much prettier than my refrigerator white board 🙂 I have only recently started to recreate some Pinterest finds. I am soooo not crafty, so I still find projects like these a little intimidating. And I had no idea there was a Hobby Lobby in RI! A lot of the DIY blogs I follow rave about this place. I’ll have to check it out! Your board looks so classic! I like it. I, unfortunately, have no good tips to share. I am always scrambling right before mealtime and often wonder how I manage to actually pull off meals Every single day, Multiple times a day. : ) Actually Chris says we will hire a personal chef before a housekeeper…..b/c while I manage to keep my kiddos fed, he is pretty much left to fend for himself. (In my own defense, he rarely likes what I make for the kids and myself, so I consider him my pickiest child, and I have little patience left for that come the end of the day!!). This board totally makes sense though b/c I often can’t remember what my go-to recipes are so having them in b& w would be so helpful! This is beautiful and makes my dry erase board made out of a poster frame with scrapbook paper inside of it look like crap! haha.